A full retreat center, Beaver Creek Youth Camp offers canoeing, horseback riding, low ropes course, swimming, rock climbing, rappelling and more. Offering camps for 1st graders - high school students. Visit beavercreekcamp.org for more info. Creede is best known for two things: silver mining and theatre. Get a taste of both in an afternoon: Become a miner for a few hours in the Underground Mining Museum. Enter mine shafts bored into the cliff face, wander through tunnels mined from solid rock, and visit with former hard-rock miners! Next, visit the Creede Repertory Theatre for an award-winning show. Specifically look for an adventurous and entertaining show for kids! Visit www.creede.com for more info. Imagine you are a child from the Ute Tribe: you have just traded the Spaniards for your first horse and now venture out to explore the area’s backcountry. Many of the hunting and traveling trails used by the natives are still used today, and for the most part offer the same view from the saddle you would have seen hundreds of years ago! 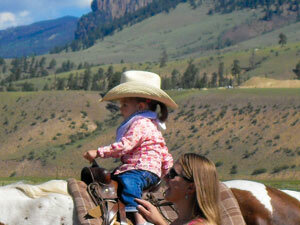 Contact a local guest ranch for a full or half day guided trip. 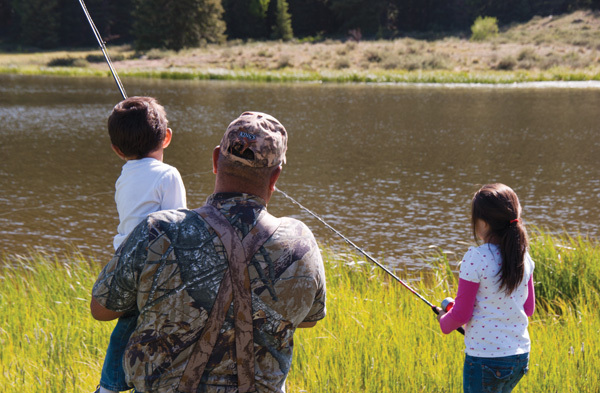 We suggest the 1/2 mile hike from Million Reservoir, a hike around Big Meadows Reservoir (2 miles), or a hike to the Largest Fir Tree in the Rio Grande Forest (1/3 mile). See this page for more information about these hikes! Roast a marshmallow, tell a ghost story, or marvel at the vast expanse of stars overhead. Check out a pair of skates at the Visitor Center and skate in our parking lot mid-December through March. Join a pick-up hockey game organized by locals. Across the San Luis Valley and against the backdrop of rugged 14,000-foot peaks, the Great Sand Dunes provide a stunning sight to behold. 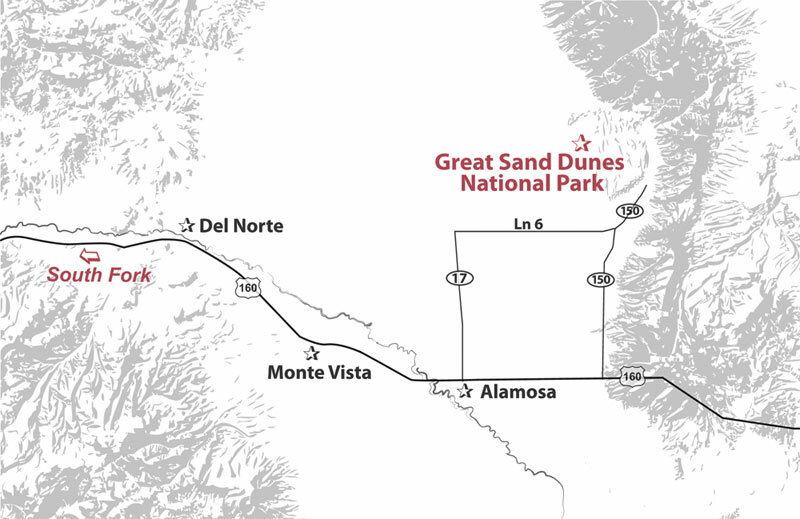 Over 30 square miles of dunes appear as a “sea of sand” against the nearly vertical face of the Sange de Cristo Mountains. These unique dunes, created by the continuous work of water and wind moving sand, provide a recreation area unlike any other. Medano Creek flows seasonally at the base of the dunes, providing a place where visitors enjoy sand, water and sun in a spectacular mountain setting. 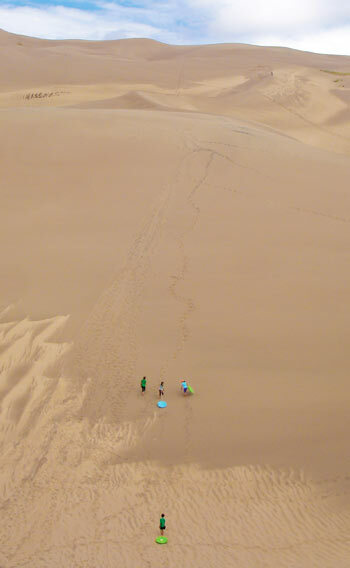 Climb the “High Dune,” nearly 700 feet above the valley floor, and sand board or “sled” back down! Before leaving the park, be sure to visit Zapata Falls. A half-mile hike leads uphill to an intriguing waterfall. 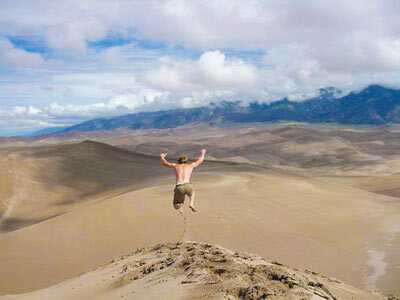 Along the trail, enjoy panoramic views of the surrounding country, including the Great Sand Dunes far below. If you wish to spend a little more time in the area, we recommend a stop by the Colorado Gator Farm, where you may view and feed over 400 gators as well as dozens of pythons, turtles, rattlers, iguanas, dragons, geckos, parrots, tortoises, and more. Learn more at www.nps.gov/grsa - Approximately 80 miles from South Fork.